Shock Hazard: Unburdened CT's should never be handled with primary current applied! Enter the information below to calculate the burden resistor required for Current Transformers that do NOT contain a built-in burden resistor. Do I need a burden resistor? Some CT's contain a built-in burden resistor. If the CT is rated in Volts per Amp (for example 0.333V at 100A) then it already contains a built-in burden resistor. If a CT is rated as a turns ratio, then it likely does NOT contain a burden resistor. The calculator below can be used to determine the desired burden resistor value. 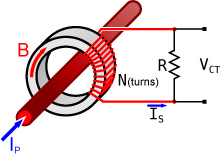 A CT encloses a primary current (Ip) and produces a secondary current (Is) through the seconday winding of N turns (the turns ratio). The voltage produced across the burden resistor (R) is given by the accompanying equation.